The American makeup market is undergoing a K-beauty frenzy. Influenced by increasing word-of-mouth on quality and affordable pricing, as well as by exposure via K-pop and K-drama stars, South Korea has seen about $69 million in exports of Korean beauty products over the last year, according to KOTRA. 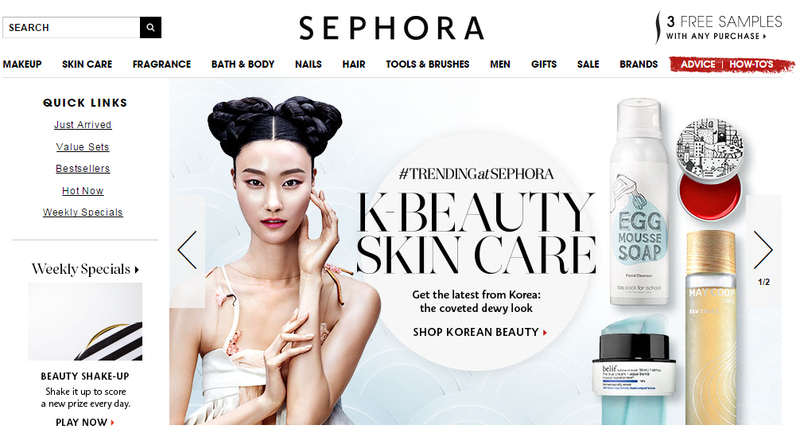 Major beauty retailers like Sephora are on board the trend: its current campaign is K-beauty-themed, with offerings promising the latest “coveted dewy look” from Korea. After the introduction of the popular Korean makeup brand Dr.Jart+ to the retailer in 2011, others — Amorepacific, Belif, Chosungah22, Touchinsol, Erborian, Tonymoly — followed. Higher-price brands like Amorepacific are now available in department stores; Laneige in Target; and others like Skin Food, The Face Shop and Nature Republic in pockets all around the country. Online retailers, too, are seeing value in K-beauty. Amazon launched a dedicated Korean beauty section earlier this year. Others, like Soko Glam, Peach and Lily and Glow Recipe, are Korean-owned online shops that offer a more intimate, thoroughly reviewed K-beauty experience.